With views of the Himalayas that can match Nagarkot and a classic old Newari town Dhulikhel is a great place to spend a night or two. The hilltop town has a history dating back over five hundred years when it was an important trading route with Tibet. Best of all, it's off the tourist trail. Many people make a full day trip out to Dhulikhel from Kathmandu but for those looking for more an overnight stay it also means getting a nice hill walk in the next day for sunrise. For the more adventurous there’s even a walk leading all the way to Panauti. Dhulikhel has had two names in the past. The first was “Dhavalasrotapura”. The Newari meaning is the “place where tigers play”. There is however another name for Dhulikhel “Dhalikhyel” meaning “Dahi (curd) selling place’. While Dhulikhel could be visited on a day trip it's well worth spending at least one night here for the great sunrise hike which includes none of the crowds found elsewhere. You can easily visit Dhulikhel from Kathmandu on an independent day trip which can encompass both a walk around the old town temples and a hill walk. .For sunrises and mountain views you are better oﬀ staying overnight and doing the sunrise view walk at dawn. It's very easy to take a bus to Dhulikhel. All buses to Dhulikhel terminate at the main stop along the Araniko Highway which is also where they leave to Kathmandu from. There's a turn off to the main square just past the bus stop. This is great if you have luggage and are staying nearby.However, for day trippers, I recommend you turn back from the Dhulikhel bus stop and take the first left. Follow the road down to Bhagwati temple. Full details and maps are available in my Nepal guidebooks. The Bhagwati Temple was reconstructed in 1647 CE by King Jagat Malla of Bhaktapur but there is no record of its original consctuction date. The temple is one of the tallest in Kathmandu further helped, visually, by the fact it’s built on the highest point of the town and on some platforms. The lower roof is decorated with corner curves and small birds standing on them. The upper roof is similar in decoration but is made from gilt copper and the birds are extremely small. The temple itself is dedicated to the goddess Bhagwati, a manifestation of Durga or Parvati,the latter being Shiva’s partner. Across the courtyard you can see a huge trident. On the stone column next to it is Durga’s mount in the form of a small brass lion also with a trident. Battered by the 2015 earthquake but surviving better than the nearby houses the golden three tiers of the Narayan temple dominates this courtyard. In front of the 17th century temple is one small Vishnu shrine and two columns with the winged Garuda kneeling before Narayan as Krishna. The courtyard here is often surrouded by locals sitting out in resthouses or tending to small stalls. Located behind the Narayanthan Temple this small three-tiered temple can be entered by the little painted archway around the wall. It is dedicated to the goddess Harisiddhi. The origin of Harisiddhi is in India. The Indian emperor Bikramaditya, founder of “Bikram Sambat”, came to Nepal and brought his beloved goddess Harisiddhi with him. 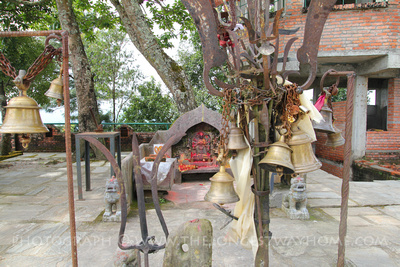 From the Harisiddhi temple there are several smaller temples along the route to Dhulikhel Bazzar which strangely is devoid of any monuments of note. Today the square is a mix of new and old businesses. In the 1960s efforts were made to make Dhulikhel a dedicated tourist destination however Nagarkot one and the main bazaar never took off as a possible souvenior and workshop area. 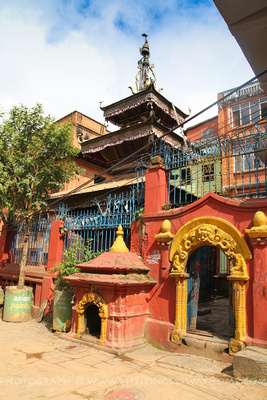 At the end of the bazaar is Sarasoti Pokhari where there is a statue to the goddess of art and knowledge. 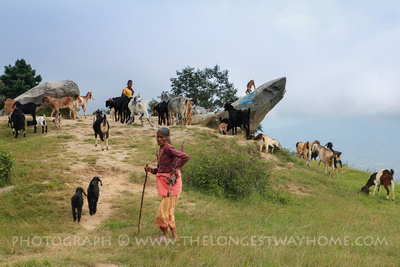 Further on from the bazaar along the main street is the route up 1000 steps to the Dhulikhel hill walk. There are two main hillwalks and hikes from Dhulikehel. The first departs from the bazaar and leads all the way up to a Kali shirine at the top with stunning views of the Himalayas. 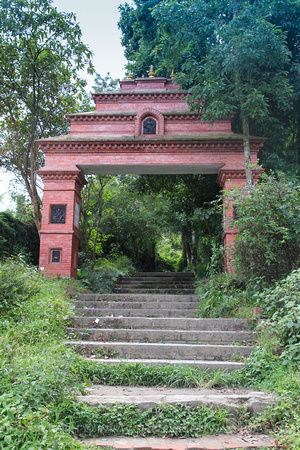 The second leads from the shrine all the way to Panauti and is known as the Namaobuddha circuit. Leaving the main bazaar/Saraswoti pond continue on the main road. Keep walking until you get to a large junction with a grassy fenced-in area nearby along with a large tree. Take the path leading to the upper right (not the smaller one further to the right). You’ll soon come to a red-brick archway leading to many steps. Whether there are 1000 steps or not is questionable (feel free to email me if you counted). There are however a lot of steps to the top. At the mid-pint there are gates to Shanti Ban, a large golden Buddha damaged in the 2015 earthquake. Continue all the way to the top of the steps where a series of dirt trails appear. Continue walking straight ahead just a few steps past the junction and look out on the lef for another series of steps just past a small blue hut. There’s a signpost here pointing the way up the steps to the Kali Shrine or on straight for the Namobuddha trail. There is no entrance fee to visit Dhulikhel or any of the temples. In 2017 a 100 rupee charge was being added for going up hillwalk (it's a bit random though). It is possible to hire a guide in Dhulikel and it is best done through your hotel. There are several transportation methods to Dhulikhel depending on your budget and schedule. Buses run from Ratna bus park every 15 or so minutes and are the most budget friendly ways to Dhulikhel. Taxi's can be expensive unless you book a two-way trip. If you are stuck for time or are looking for a private vehicle plus guide to show you around then taking a private tour is a good option. Why do all the tour agents say Nagarkot is better than Dhulikhel? Because there are more hotels and accommodation in Nagarkot who pay them commissions! It's a simple as that. A few big hotel companies started up in Nagargot about 10 years ago and it's been that way every since. You can read more about the differences between Nagarkot and Dhulikhel here. Full directions to Dhulikhel with maps, guide, hotel and restaurant reviews are available in my guidebook below. There are not many restaurants outside of guesthouse and hotel restaurants. By Sarasoti pond there are group of ever changing local restaurants of various types and standards. Pizza Hub Restaurant looks about the best there but pizzas are very Nepali but thankfully there is a menu with local items as well. 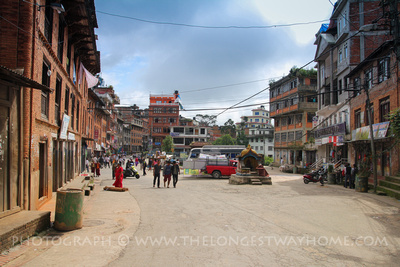 Opposite there are several typical tourist type restaurants like Love Bird and Newari Kitchen. Stick with the basics and keep expectations low. Hotel restaurants are open to everyone and worth a look. There is a broad range of accommodation available in Dhulikhel. The majority of hotel are located near the main road where the bus stop is located and out towards the Kali Shrine. Along here many refer to themselves as "resorts". Some genuine are while others are stretching the truth. In the old city hotel pickings are very limited and much more along the lines of guest houses. If Dhulikhel ever picks up popularity similarly to Nagarkot this area is sure to become full of boutique style guesthouses. One thing to be careful of when booking online is that "some" hotels often say they are in Dhulikhel whereas they are actually no where near the town itself. services & facilities in all Nepal you will be pampered & catered to here. Nawaranga Restaurant & Guest House is a long running guest house and the best in the budget range. Run by friendly Purna & his wife they also have a mini art gallery on show. It's located shortly after the Saraswoti Pond. Panorama View Lodge Resort is located near the Kali Shrine with stunning views of the Himalayan mountains. While the rooms are nothing special (dated) the views on a clear day are. Due to this alone it’s worth checking out. More accommodation and maps showing their location can be found in my guidebook to Nepal. If you are going all the way to Nepal then you'd be wise to get the best guidebook to Nepal and make the most of your trip.